It’s time to post a little update on my grocery savings methods! I just realized it’s been two years since I shared my current strategy – and it has changed. So here it is! I usually visit two different grocery stores each week – Aldi and Lowes Foods (my local higher end grocery store). Shopping with a list might seem like an obviously good idea, but when you buy a lot of the same things each week it doesn’t always seem necessary (it is). Before I go to Aldi, I mentally walk through the store and write down the things I need in the order they appear in the store. Aldi is hard to maneuver and I’m all for saving myself extra time in there! Once I’m in the store, I cross things off as I put them in my cart. This saves me time and money. 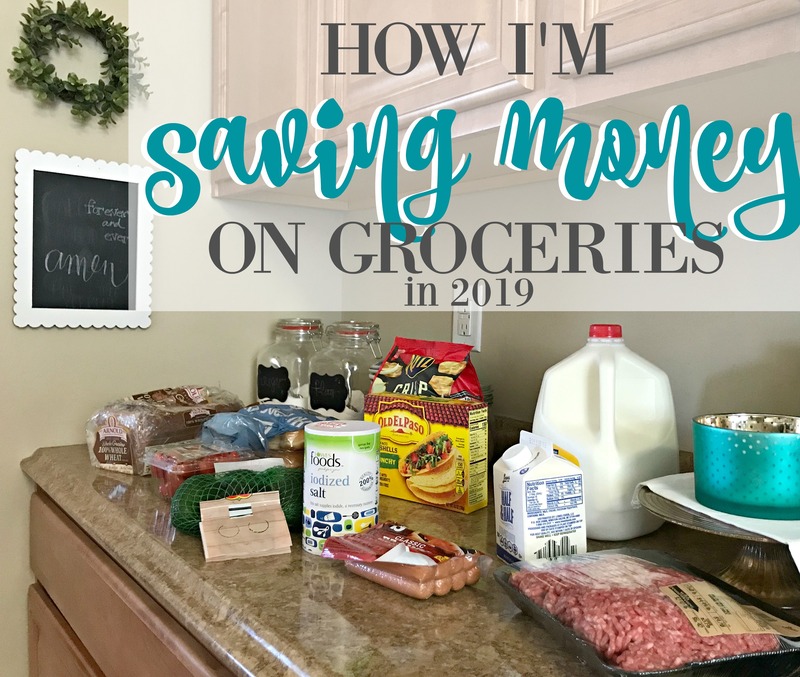 Before I go to Lowes Foods, I visit Southern Savers and create a list based on the sales for that week (this is called shopping the sales cycles and is the best way to shop a regular grocery store). You can see one of my shopping lists here – I love that it tells me which Lowes Foods e-coupons are available to be clipped, and I make sure I have those loaded onto my account before I shop. When I was sick with the flu earlier this month, I took advantage of their online grocery ordering service. I still made a list before I started shopping to make sure I got the best deal and didn’t forget anything I needed. Everyone’s grocery budget is different, based on the cost of living in your area, the size of your family, your dietary needs and how many meals you eat at home each week. I allow myself an average of $75/week for the two of us. All of my meals come from that budget, and Paul eats at least one meal a day at home. This doesn’t include household products – sticking to my grocery budget gives me extra cash for those things! Some weeks I spend more than $75 if there’s a good deal on meat or if I’m restocking our supply of something else. When that happens, the following week I only shop at Aldi. 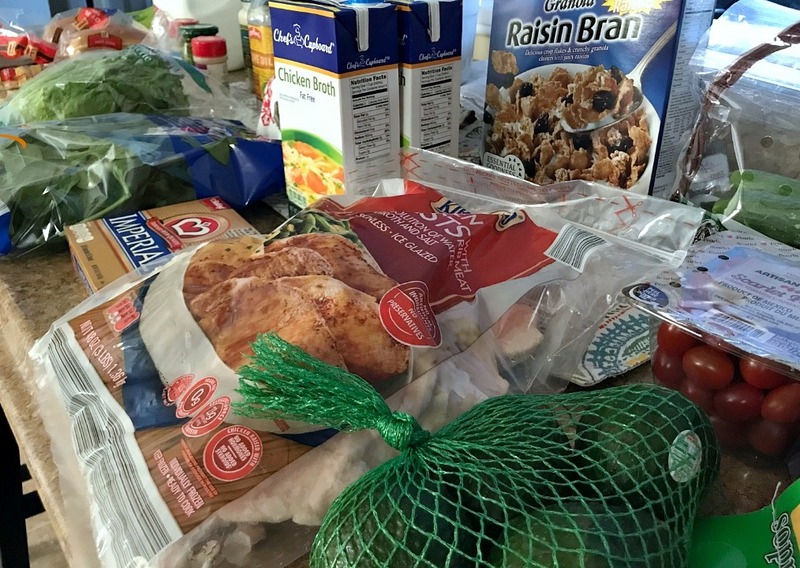 That helps me to keep the budget even – I can usually stock up on everything we need for the week with about $40 at Aldi (given that my freezer and pantry are usually well stocked). Don’t be afraid to adjust your weekly budget if it’s not meeting your needs – unless of course, your finances dictate that you only spend that set amount of money on groceries. If you’re not sure how to find room in your budget for extra groceries, send me an email. I’m happy to help you look for other ways to save on those expenses! I’ve also begun shopping at Dollar Tree with a careful eye, looking for the best deals on things like toothpaste, small trash bags, condiments, batteries and other various cleaning supplies. Read this post for all my favorite things to buy at Dollar Tree! That’s it! You’ll notice I didn’t say much about coupons – which is unlike my grocery savings strategy in past years. In my opinion, couponing has changed and isn’t nearly worth the effort that it used to be. I haven’t even found much benefit in rebate apps like Ibotta or Savings Star – the only one I use regularly is Target’s Cartwheel app! 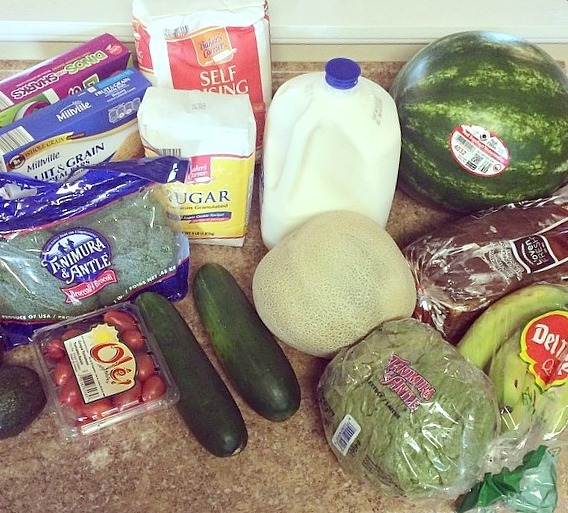 What questions do you have about saving money on groceries? Leave them below and I’ll do my best to answer them directly or in a follow up post! very good ideas…………i agree couponing is not as “profitable” as it use to be. great post. Great tips, Whitney! Grocery shopping sure can be a challenge, can’t it! My current way of saving money on groceries is sticking to my budget, sticking to my list and using a combination of Aldi’s and Walmart grocery pickup. At Aldi’s, I stick to my list and only buy the cheaper items that are good quality. For Walmart’s grocery pickup, I create my list (which also keeps me on budget since the app keeps a tally of your total cost! ), and simply go pick up my order and avoid being tempted or buying unnecessary items in the store. I love your strategy, Colleen! My local grocery store offered a 30 day free trial of their online pickup, and I’ve had the same experience. It really helps me stick to my budget! That’s awesome! Maybe they are trying to target more of your market instead of basic name brand shoppers. I’m so glad it’s benefiting you! You are so right! The coupons and money saving apps don’t seem to be worth the time and effort required these days. I will occasionally still use them, but the best deals are in store sales combined with the coupon apps each store offers. I’m working on lowering our grocery bills this year by shopping at Aldi much more. I try to stock up when things go on sale there and try to find more and more Aldi brand products I love. I wonder if the popularity of online grocery ordering has anything to do with this trend? You’re right, the store’s coupon apps are the best place to “clip” those coupons! Great tips! I needed some fresh motivation for sticking with the grocery budget, so this helps. Btw, my little boy loves watching your you tube videos with me. 😁 As each one starts he asks, “Is Mr. Paul on this one?” 😄 Those are his favorites! It’s a guy thing! I’m glad you said this about coupons! I’ve tried to get into the coupon game, but just don’t typically buy the items coupons are for – generic is often cheaper at my store than name brand even with a sale + coupon. I feel like I don’t use enough coupons to justify the cost of the paper! I haven’t purchased a paper in years, Rebecca. You’re right – it’s not worth the cost of buying one! There are some printable coupons that are really good. If you make a list using Southern Savers’ website, she’ll give you a direct link to print the coupon. I use a few of those here and there on a few household items. I used to be a real bargain shopper when the children were home because well, I had to be one! However now that it is just the two of us I have changed a bit. I figure we deserve a few perks at this stage in our lives. I used to shop exclusively at Walmart but then a Publix was built about one mile from my house. So I started going there. While some things are higher their BOGO, customer service and the free service of taking the groceries to your car, has made me a regular customer. I found out that even though the groceries were cheaper at Walmart, I got sidetracked by non grocery items there. Now I come home with only groceries. Also I have become a member of Grove Collaborative because they carry products I cannot find here in my area. And it comes right to my door which I love. I am right there with you on enjoying the amenities of a nice grocery store! There are quite a few things that I can get better deals on when I shop Lowes Foods (a lot like Publix) instead of Aldi. They also offer online grocery ordering, and that was great when I had the flu! I just made my order and had Paul pick it up. These are great tips! I do most of these same things regularly. Another way we save on stocking our freezer is to check the managers special section in the meat department—as long as you freeze or prepare those items right away they are fine! Our Walmart often has leftover loaves of bread and rolls from the bakery for 50 cents or less that freeze well, too! I totally agree on apps like Ibotta—they often end up costing me more in the long run trying to buy name brand or ending up in a store with impulse purchases just so I can earn that $1 rebate. Not worth it! That’s a great tip for saving money on meat – especially because there aren’t always great sales on those things. I agree with you on Ibotta!